Approfitta di alcuni dei migliori rafting sulle acque bianche del Costa Rica in questo tour guidato di un'intera giornata con pranzo tradizionale incluso. Pedalate nella foresta pluviale e sulle rapide del fiume Balsa fermandovi a nuotare e riposare nella natura. Dopo la tua avventura, goditi un pranzo in stile costaricano in un ristorante locale. We went on two rafting trips with Aurelio as our guide- he not only made sure we were safe, but also made it thrilling! With 4 kids, each with different thrill thresholds, he made sure each child was comfortable and also had an amazing time. On our second trip, the water level was quite high, making the river faster and the rapids nearly constant- exciting trip! Can’t say enough good things about Aurelio. Great time was had by all 4 in our party. 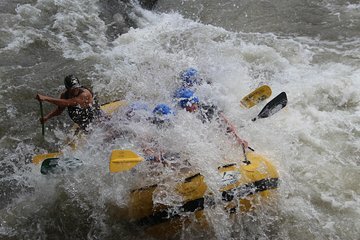 I have never gone whitewater rafting and was quite nervous about trying the 3 - 4 rapids, but the tour guides were all very well trained and showed us a great time!! Highlight of our trip to Costa Rica!